Situated on Spain’s North East coast, a mere 2 hour flight from London, lies the hustle and bustle of Catalonia’s greatest city. From the sandy beaches of the city center, to the non-stop maze of bars and clubs scattered throughout, Barcelona is the ultimate destination for a weekend abroad with the lads. If you are within Europe, there are no excuses. Everyday hundreds of cheap flights land in Barcelona’s El Prat airport, with hundreds more hitting the RyanAir runways of the nearby Girona and Reus airports, both within just 90 minutes of Barcelona’s city center. Momondo.com will allow you to search for the cheapest flights to Barcelona, including both the Girona and Reus airports automatically. Once you have landed the limits are endless. Kicking off with an ice cold sangria on the Barceloneta beach is a sure fire way to get the weekend started right. The numerous “Churinguitos” or beach bars that line the coastline, are a great stop for both beers and sangria. Anything more than this, such as cocktails or a bit of grub, should not be done at these bars. The prices are five star, while the quality is on par with a college cafeteria. The Port Olimpic has some decent options for food, although on summer weekends, it can often be impossible to show up with a group and lack of reservations. The Port Olimpic is also a great location after hours. Home to Barcelona’s trendiest and most famous nightclubs, this has been the go to spot for this city’s party crowd since its development in 1992 for the Summer Olympic Games. The most recent of these clubs is “Pacha”, a sister club to the world famous Ibiza nightclub of the same name. On average these clubs cost about €15-€20 to enter, often including one drink with the entrance. The cover charge can usually be skipped if you have a rep helping with your vacation. Reps can also be very useful in ensuring you actually enter the club, as many of these big nightclubs frown upon large groups of men. Do not wear fancy dress, they will not let you in. No exceptions. Dress to impress… that means no shorts! Keep in mind, Spanish partying starts late, very late. It is not uncommon for these clubs to be completely dead until 1:00 AM. If you spend all day drinking in the sun, a traditional midday siesta may be the only solution to allow for more partying. After closing the club at 6:00 AM, spending an hour trying to find a non-existent late-night kebab shop, yet eventually surrendering to your rented bed, it is not uncommon to wake up well into the afternoon. It is for this reason you should avoid booking any activity before noon. Just like Barcelona’s nightlife, the days here start late, and so long as you are up before 2:00 PM you should be able to make the most of your day. Barcelona has your typical stag weekend activities; paintball, go karting, limos, the works. Thanks to its coastal placement however, this city is able to offer a whole lot more! The most popular of these unique activities, not just with stags, but with all the travelers alike, are the coastal booze cruises. A couple hours’ unlimited beer and sangria as you party up and down the coast. Some of these boat trips even include an all-inclusive BBQ, as well as a chance to anchor up, and go for a swim. If an afternoon back on the drink is testing your gag reflex, perhaps a day up in the world famous Costa Brava is a better choice. 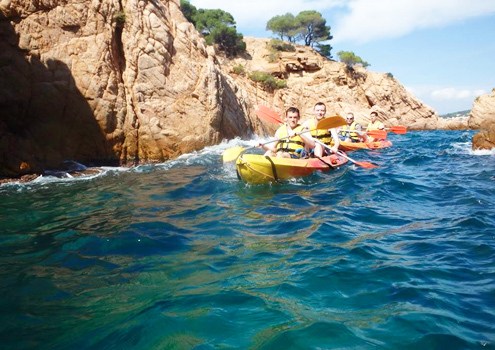 Kayak and snorkeling trips are a popular way for stag groups to explore the jagged cliffs, and caves, of this amazing part of Spain. Pissup.com offers both these activities, as well as several others. They are well established and provide free consultation so it is a good idea to see what they can offer you before trying to plan everything on your own. Sundays are a day of rest and relaxation, and in Barcelona, nearly 80% of the city shuts down on this day. This is a good reason to plan for the beach. Most hotels and apartments will allow you to leave your luggage after checkout, so you can pack up, drag yourself to the water, and let the last few rays of sunshine wash away your sins. This is the perfect close to an amazing weekend in Barcelona, and you will honestly be amazed at the curing properties the Mediterranean Sea seems to have on your aching body. So what are you waiting for? Leave the dreary London skyline behind and lose yourself in the Spanish city that never sleeps!